Morton is a new band from The Ukraine. For most people, Morton are probably the first band they'll have heard from The Ukraine - a country not well known in international rock and metal circles. The band was put together initially as a studio project by vocalist Max Morton who also runs his own studio and has produced many Ukranian rock and metal bands. The band released an EP, "Grimoire" and the tracks from that (Black witch, Oblivion, Werewolf hunt, and Grimoire) have been improved and included in this, their debut album. "Grimoire" has a nice build up to the song which combines some quite gentle music with soft vocals which gradually build to a slow power metal track. "Azrael" is another slower paced track, but its deep spoken introduction and a heavier guitar track make this song have a much darker feel than "Grimoire"
In contrast, "Werewolf hunt" is a fast paced power metal song, but then with a title like that you could make a fairly good guess what the song would be like - a hunt is going to be fast paced, and the mention of a werewolf suggests its a power metal track as Power metal as a genre is well known for its fantasy, mythology and folklore based lyrics. 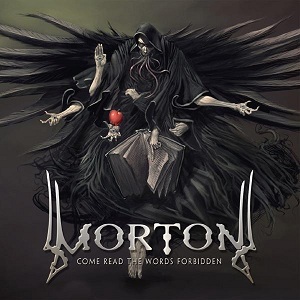 This is a good power metal album from Morton - a band that certainly bears watching as a debut as strong as this shows a lot of promise for some great albums in the future. This album isnt anything particularly new or innovative, but it is a damn good piece of enjoyable power metal.